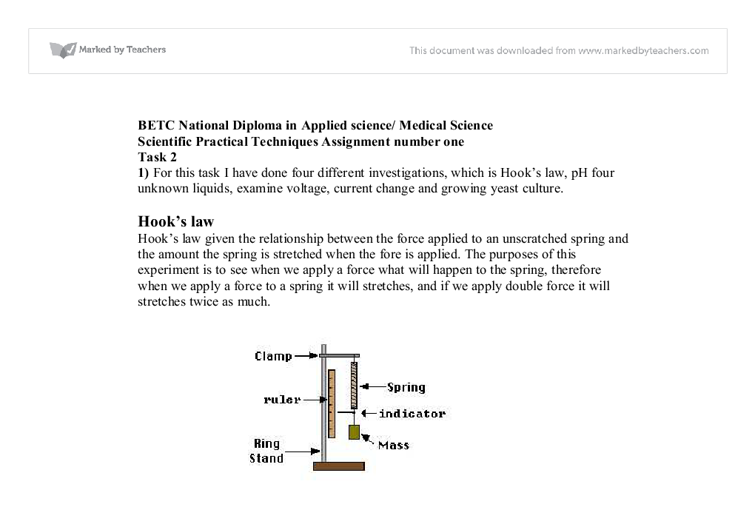 BETC National Diploma in Applied science/ Medical Science Scientific Practical Techniques Assignment number one Task 2 1) For this task I have done four different investigations, which is Hook's law, pH four unknown liquids, examine voltage, current change and growing yeast culture. Hook's law Hook's law given the relationship between the force applied to an unscratched spring and the amount the spring is stretched when the fore is applied. 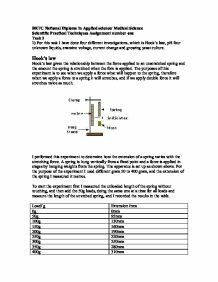 The purposes of this experiment is to see when we apply a force what will happen to the spring, therefore when we apply a force to a spring it will stretches, and if we apply double force it will stretches twice as much. I performed this experiment to determine how the extension of a spring varies with the stretching force. A spring is hung vertically from a fixed point and a force is applied in stages by hanging weights from the spring. The apparatus is set up as shown above. For the purpose of the experiment I used different gram 50 to 400 gram, and the extension of the spring I measured it metres. To start the experiment first I measured the unloaded length of the spring without touching, and then add the 50g loads, doing the same one at a time for all loads and measure the length of the stretched spring, and I recorded the results in the table. ...read more. calibrating the metre once a week will help obtaining good result and using more equipment instead of using one baker, using three clean bakers it could improve the result. 3) Examining how the voltage and current change 1) In order to do the investigation how voltage and current changes I used different instrument, such as 1.5v batteries instead of using high power batteries, to two bulbs, ammeters and voltmeter. An ammeter measures the current and used in series and voltmeters measures the potential difference across the resistance and used in parallel. 2) Result table Series 1 battery 1 bulbs Ammeter 0.02 Voltmeter 1.45 2 battery 1 bulbs Ammeter 0.03 Voltmeter 2.99 2 battery 2 bulbs Ammeter 0.03 Voltmeter 3.00 1 battery 2 bulbs Ammeter 0.02 Voltmeter 1.47 Parallel 1 battery 2 bulbs Ammeter 0.02 Voltmeter 1.39 2 battery 2 bulbs Ammeter 0.29 Voltmeter 2.78 D4 3) In order to use the equipment first I set up the ammeter in series to measure the current and voltammeters in parallel to measure voltage (potential difference). Because of the different quantities they measure and because of the make up of a circuit I did wired into a circuit differently to each other. I start the investigation by placing 1 battery and 1 bulb to see the change in the ammeter and voltmeter particularly in ammeter, because since the ammeter is in series in the circuit I need to make sure that it has ...read more. To make sure my measurement is accurate first I have to check my first sample, it should gave me leas cell because it is the early stage of the yeast to be placed on the higher temperature or it is the first test to be check, therefore the more the yeast culture stays on the temperature the more it will growth and the number of cell per square has to be increases. To improve the accuracy of the measurement it is essential to be extremely careful with higher power objective, since the counting chamber is much thicker than a conventional slide. The chamber or an objective lens may be damage and the whole investigation may outcome an accurate result, so the user has to know the basic knowledge of using microscope and finding the square of the haemocytometer. In addition it is important to be precise when dropping the sample in to the chamber, make sure that the chamber is fully loaded with liquid and all the equipment needed for the investigation has to be clean before starting the experiment, also the haemocytometer and the cover slip has to be clean with sterile wipe tissue again and again before butting another sample for test, this will help getting accurate result. Generally to obtain accurate result consistently it is important not to overload the chamber as doing so will give an inaccurate count or result. ?? ?? ?? ?? ...read more. If I didn't swirl the solution then the area in the middle of the conical flask where the sulfuric acid was falling would turn pink first as the OH- particles and H+ particles in that part of the solution would have reacted. n/a In case of fire: keep drums etc. cool by spraying with water but no direct contact with water. Inhalation Corrosive. Burning sensation. Sore throat. Cough. Struggling to breathe. Shortness of breath. Ventilation or breathing protection. Fresh air, rest. Half-upright position. Artificial respiration may be needed. Refer for medical attention. Buffer solution has a buffering capacity. What is meant by this term ? Buffering capacity can be defined in two main ways: (1) Maximum amount of either strong acid or strong base that can be added before a significant change in the pH will occur. * Removing the unsaturation raises the melting temperature. * Emulsifiers, yellow coloring, butter odors, common salt and antioxidants are then added. * The mixture is ripened with skimmed milk In the early century, cheap margarine caused some dietary deficiency because of the lack of natural vitamins. Four years later in 1869 the Russian chemist Dimitri Mendeleev started the development of the periodic table, arranging chemical elements by atomic mass. He predicted the discovery of other elements, and left spaces open in his periodic table for them.